As a photographer, your mind is always on your subject – whether that is a person, a physical object, an idea, or an inspiration. But if you are wondering why many of your images look and feel more like snapshots than photographs, it may be because you are focusing too much on your subject and not enough on everything else in your viewfinder. The background of the image is often overlooked by beginning and casual photographers. Everyone has, at times, fallen prey to the allure of the subject and neglected to notice some background detail that will, upon discovery, ruin what might have been a wonderful image. This category includes the classic ‘pole growing out of someone’s head’ shot where the subject accidentally aligns with some background object, as well as many other ‘not quite right’ shots. 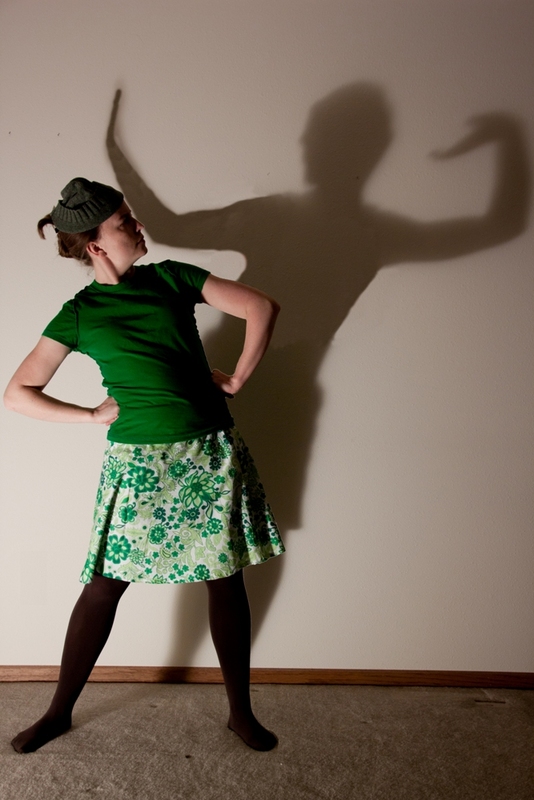 Some of these background mistakes can be remedied in post-processing. In the example above, I was using my apartment wall as a neutral background, but I neglected to notice the distracting electrical outlet in the bottom left corner. A little bit of patching in Photoshop replaced the plug with wall, and this small change made a tremendous difference in the overall focus and flow of the image. Many times, however, the background and its distractions are so integral to the image that it may be beyond the reach of post-processing to remedy (or certainly beyond the length of time I’d be willing to commit to try). The best and simplest solution is to remember the background when you are shooting and, if you come across a distracting background, use your feet. These two photographs of lilacs were taken of the same bush within moments of each other, but the backgrounds give each image a very different feel. In the top image, the background is very busy, with several sharp diagonals and a stone path leading the eye out of the image and away from the flowers. 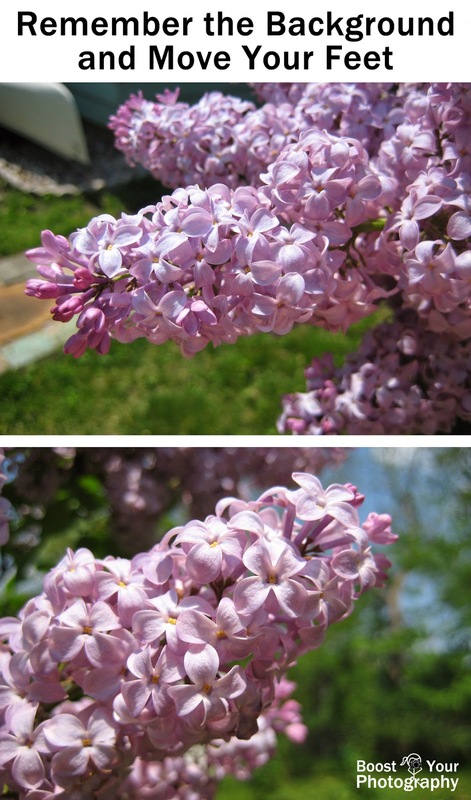 In the bottom image, the background is more consistent and more blurred, with a hint of other lilac bunches and trees beyond. The colors blend well together and it makes for a more harmonious image overall. Two major things played a role in the differences in the background. The first was that I moved my feet. Changing the perspective of an image requires you to move physically, whether that means moving your feet, standing up or getting down, or trying a different angle or viewpoint with the camera. (Zooming in or out can change how things appear in an image but will not change the perspective. Read more in Zooming vs. Cropping: perspective in photography.) In this case, I looked around longer and, instead of pointing my camera at the lilac with the stone path behind it (top image), I turned and got lower, so that the lilac bunch was silhouetted against the more distant branches and trees (bottom image). This led to the second major difference in the background – the out-of-focus background achieved in the second image. The depth of field of an image (the depth of the focal plane or area in sharp focus) varies based on a number of factors, including aperture, focal length, and distance. The further away something is from the focal plane, the more blurred or out-of-focus it will be. So, because the trees behind the lilac bush (bottom image) were fifty feet away, they appear nicely blurred, while the stone path (top image) was only five feet away and appears more angular and distracting. A simple tip for achieving the blurred background look with any camera or lens is for you to get physically closer to your subject while keeping them physically further away from the background. This is a trick often used by photographers for outdoor portraits. Close-up of a crab apple tree, demonstrating the difference in making small changes to the aperture. Depth of field is also affected by the aperture used: a wider aperture (small number, but larger fraction, like f/1.8) has a much shallower depth of field so less of the image will be in focus, while a narrower aperture (larger number, smaller fraction, like f/22) has a much wider depth of field so more or all of the image will be in focus. The triptych above demonstrates the impact of even small changes in the aperture: varying from f/5.0 to f/1.8. At f/5.0 some of the further back leaves are still in focus, while everything except the closest leaves are out of focus at f/1.8. Read more about Aperture in the series that begins with Aperture and the F/Stop Conundrum. So, the next time you prepare to take a photograph, stop for a moment, ignore your subject, and consider the background. If you find something distracting, try moving your feet or adjusting your aperture to get more blur. You may find that a small change in perspective can make a big change in your final image.